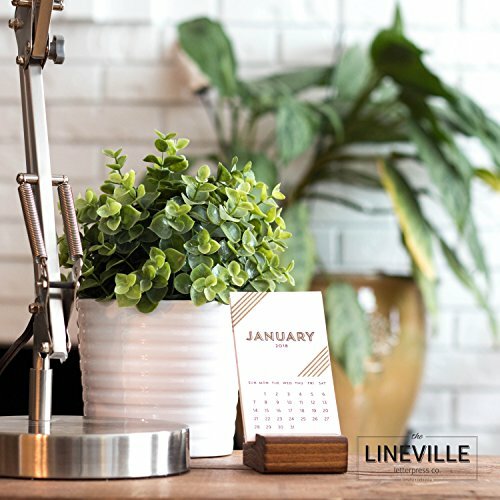 This calendar is the perfect addition for any desk - from your home to your office. With a minimalist design printed in two colors this calendar is sure to please. The calendar is a must have for any letterpress lover and is a perfect gift for family, friends, teachers and also makes a perfect stocking stuffer or secret santa gift! - Includes - 12 months with current month and year printed in a gold and black ink Wood base is hand cut, stained and polyurethaned by myself - Size - Calendar pages are 2.5" wide by 4.5" tall With wood base, size is 2.5" wide and 5" tall - Paper - Printed on 110lb Lettra 100% cotton paper Made from 100% renewable paper Note: Each ink is hand mixed and each card is hand printed so slight inconsistencies may occur. Monitors may vary slightly in displaying colors. Here's to an awesome 2018! If you have any questions about this product by Lineville Letterpress, contact us by completing and submitting the form below. If you are looking for a specif part number, please include it with your message.